HomeArchivedWelcome to YOUR new U3A Moraira-Teulada site! Welcome to YOUR new U3A Moraira-Teulada site! Click on the top picture to get back home! I am happy to welcome you to YOUR new site – it’s designed by a U3A member for other members, with the purpose of providing the visitor with as much information about our U3A as you wish to find, while making it a pleasant experience. The site contains information about the organisation, meetings, group activities, travel events, newsletters and other activities of our U3A and its members. We also have a page on Facebook. Please check it out and leave your feedback – on the Facebook page, of course, because comments are not permitted on this site, to prevent spam. Editors and authors are now in charge of the content, the web administrator being one of several contributors, besides providing support and tuition – under the overall authority of the President and the Committee. For those nostalgic for the old site, they can admire our previous webmaster’s work, which is still available online, but it’s no longer updated and information contained in it will become outdated with time. Thanks to my predecessor, Mike Lawson, for all the great work he has provided during the years and for his generous help in coming to grips with our web setup. Your feedback about the site, suggestions and (we hope few) bug reports is welcome: please contact the web administrator. PS: Wherever you may be in the site, you can get back to the main (home) page by clicking on the picture displayed at the top! The new site employs posts and pages. Posts are displayed on the front page, and are used for news and updates. As new posts are added, the previous ones scroll down, until they move off the front page. 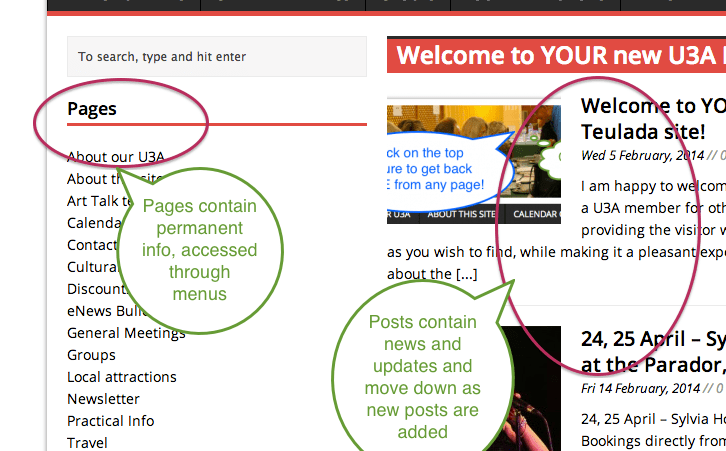 Pages are used for permanent information and can be reached through a menu structure.